Today we saw a rare sight where MS Dhoni went out of character and showed his anger in the open. This started with Stokes bowling a full ball above waist height, which the umpire instinctively signaled a no-ball but looking at the square leg umpire who did not give the signal, backout out of his call. 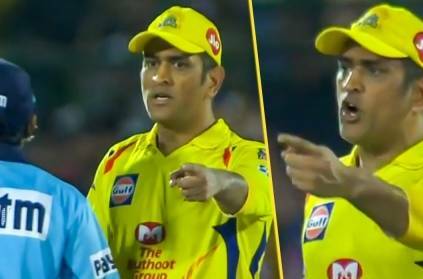 This really sparked the anger amongst the CSK players as captain MS Dhoni walked out to the middle from the Dugout and had a heated argument with the umpires. Looking in hindsight, it did not affect CSK as they won the game, but this action from MS Dhoni does not go well with the spirit of the game. Subsequently, MS Dhoni was fined 50% of his match fee. The press release from IPL said that "MS Dhoni, the Chennai Super Kings captain, was fined 50 percent of his match fees for breaching the VIVO Indian Premier League's (IPL) Code of Conduct during his team's match against Rajasthan Royals at Jaipur. Mr Dhoni admitted to the Level 2 offence 2.20 of the IPL's Code of Conduct and accepted the sanction," said a media release from IPL"
This page contains news relating to various facts and events. The views are generally about current affiars and general topics in diversified areas such as political, international, national, and regional issues, sports, health, travel, lifestyle, technology and business. People having similar interets on the above topics will find this page useful. MS Dhoni fined for his actions in the match against RR | Sports News.